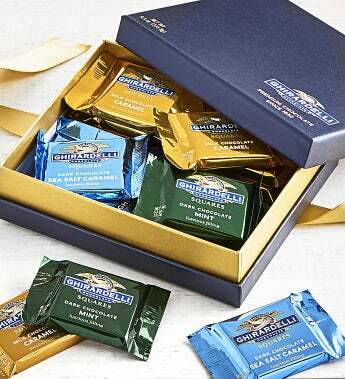 This gift box of Ghirardelli ®Squares® Chocolates makes a distinctive presentation that will wow any gift recipient. They will be even more amazed once they taste this iconic American chocolate. This Signature box is filled with an assortment of three of Ghirardelli's most popular flavors: Milk Chocolate with Caramel, Dark Chocolate Sea Salt Caramel, and Dark Chocolate Mint. Each is individually wrapped to last long - but we'll bet they won't! Ghirardelli is an iconic American chocolate company that was started in San Francisco in 1852 by an Italian immigrant. Their flagship store is still located on the San Francisco Bay waterfront where their original factory stood. Ghirardelli is now known worldwide for their decadent chocolate squares. 18 pc Ghirardelli® Squares® Chocolates Box 8 ea Milk Chocolate with Caramel Filling 5 ea Dark Chocolate Sea Salt Caramel 5 ea Dark Chocolate Mint Gift Measures 6" x 5"" x 1.5"
Gift Measures 6" x 5"" x 1.5"
This gift box of Ghirardelli ®Squares® Chocolates makes a distinctive presentation that will wow any gift recipient. They will be even more amazed once they taste this iconic American chocolate. This Signature box is filled with an assortment of three of Ghirardelli's most popular flavors: Milk Chocolate with Caramel, Dark Chocolate Sea Salt Caramel, and Dark Chocolate Mint. Each is individually wrapped to last long - but we'll bet they won't!